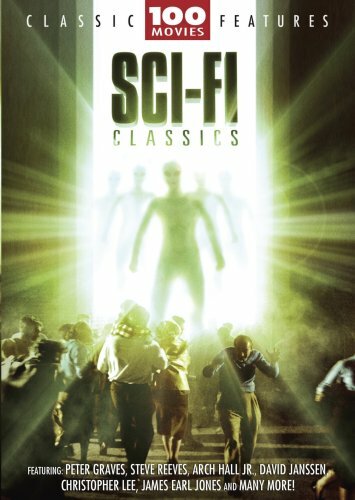 These 100 classic movies are sure to please Sci-Fi fans of all tastes and ages. Marvel at the transformation of The Wasp Woman. Fear for the survival of the planet when only a flying turtle, Gammera the Invincible, stands in the way of oblivion. Flee in terror at the emergence of The Snow Creature. Feel your skin crawl when you encounter the Horrors of Spider Island. Prepare yourself for an interplanetary cataclysm in Crash of the Moons. Journey to a primeval and dangerous land in Voyage to a Prehistoric Planet. Try and survive the carnage and mayhem in Destroy All Planets, Cosmos: War of the Planets and Killer from Space. Enter a new dimension of terror as the planet faces extinction in The Day the Sky Exploded, The Doomsday Machine, End of the World and Unknown World. Face alien threats in Alien Species, Embryo, The Manster and Attack from Space. Discover hideous creatures in Beast of the Yellow Night, Fury of the Wolf Man and Snowbeast. If you have any questions about this product by DIGITAL1STOP, contact us by completing and submitting the form below. If you are looking for a specif part number, please include it with your message.